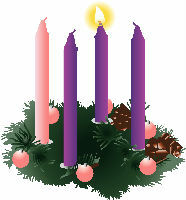 Advent – the religiou s equivalent of the secular message that there are only twenty four shopping days until Christmas. Ask anyone, clergy included, how their preparations for Christmas are proceeding and you are likely to be answered with moans and groans about all the work involved and how Christmas has become a chore. It is not trendy to say that you are looking forward to Christmas. What a miserable lot we have become! Isn’t this what God did on that first Christmas so long ago? He sent his Son into the world, to be with us, because He loves us. He came to a world unprepared, no Christmas cakes, no Carol services, no nice clean decorated house, but to a cold dark stable; and from that stable, His message of hope and love has spread throughout the world and continues to spread. If the people of Bethlehem had known that first Christmas, that God’s Son was going to be born, there would have been a frenzy of activity, excitement and rejoicing. We, today, do know, and yet we do not appear to be rejoicing but complaining. What message does this give to non-christians and non-churchgoers? In this period of Advent, which marks the beginning of a new church year, we have the chance to prepare our hearts and minds anew for the coming of Christ into our lives, and we should do so with a spirit of happiness and celebration, so that when people ask if we are looking forward to Christmas, we can joyfully say ‘Yes. It is the day God sent His Son into the world, to be with us, because He loves us.’ This is what we celebrate at Christmas, the birth of a child whose life changed the world forever, and the season of Advent is a call to wake up and reflect on how we prepare our lives for His coming. He was born in a stable, in an obscure village, the child of a peasant woman. He worked in a carpenter’s shop until he was thirty and from there he travelled less than 200 miles. He never wrote a book. He never held office. He never had a family or owned a home. He did none of the things one usually associates with greatness. He became a nomadic preacher. He was only 33 years old when the tide of popular opinion turned against Him. He was betrayed by a close friend and his other friends ran away. He was turned over to his enemies and went through the mockery of a trial. He was unjustly condemned to death, crucified on a cross between two thieves, on a hill overlooking the town dump. And when dead, was laid in a borrowed grave, through the pity of a friend. Twenty centuries have come and gone, yet all the armies that ever marched, all the navies that ever sailed, all the parliaments that ever sat, and all the kings and rulers that ever reigned, have not affected the life of mankind on this earth as that one solitary life. He is the MESSIAH, THE SON OF GOD, JESUS CHRIST.